In a big push to Namami Gange programme, National Mission for Clean Ganga under Ministry of Water Resources, River Development and Ganga Rejuvenation has awarded for the first time contracts for three STPs under hybrid annuity model. Two STPs of 68 MLD and 14 MLD will be set up at Haridwar and one STP of 15 MLD at Varanasi. This Hybrid Annuity model is first of its kind in the country’s waste water management sector. The Central Government will completely fund the STPs construction ensuring that there is no shortage of resources for the project. The unique financial model will ensure the transparency and accountability of the running of sewage treatment infrastructure. The contractors will not only establish the sewage treatment plant but they will also operate and maintain it for a period of 15 years. Thereafter it will be handed over to the local bodies. This will ensure that no waste water is dumped in the holy river. The payment of the operations and management of the projects and the worth of the cost will be provided to the agency over a period of 15 years ensuring that the project runs smoothly. 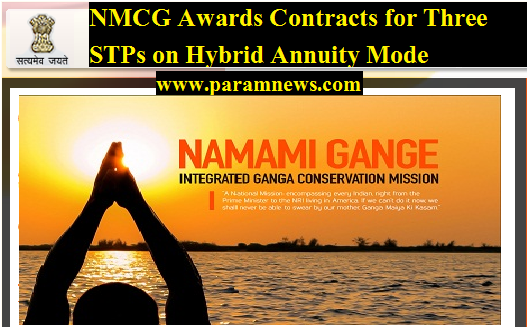 Namami Gange programme, National Mission for Clean Ganga under Ministry of Water Resources, River Development and Ganga Rejuvenation has awarded for the first time contracts for three STPs under hybrid annuity model. Two STPs of 68 MLD and 14 MLD will be set up at Haridwar and one STP of 15 MLD at Varanasi.